This post is dedicated to any mango friend who has ever had their treats stolen. Treats stolen? Yeah. Treats stolen. You know, the treats that you stash somewhere in the depths of a kitchen cabinet. The kind of treats that are just for *you*. The kind of treats that you look forward to munching on after a Holy-Mother-Train-Wreck-of-a-Day. I had such a stash. I did. And now it’s gone. “Maybe the cats ate the treats?” Please. Mango friends, if this has ever happened to you, I am here to sympathize and commiserate. And to add mango insult to mango injury, get this: The perpetrator, after violating the household treaty on treats by consuming the treats, grinned ever so happily…no, proudly…and announced that everyone should stay out of a certain area of the house because the consumption of such volume of said treats caused a certain kind of “problem.” Yeah. You know the kind of problem I’m talking about. Innocent household pets have been taking heat for this kind of “problem” for all eternity. So no, dear Perpetrator, the cats didn’t eat the treats, nor did the cats have any sort of “problem.” I’m thinking I’ll sleep with them. Red Mango & Scarlett Mango. Really Safeway? Your Produce Marketing BS is being outed… Right Here. Right Now. Small Mango Mania. Are They Worth the Discount? Costco Guy Needs Mango Education! Previous Post: « Mikey Likes Mangoes…What a Heavenly Life! US Consumers and Mangoes. Boy, do we have some learning to do! “Mango” in many languages. Just because. Needless to say, I love mangoes. Hi there! Carolina here, but I live in Florida. I created Mango Maven to drive awareness about everything that you need to know about mangoes. Recipes, tips, growing and (of course) eating these amazing superfruits. Condo Mango Trees & Dwarf Mango Trees. I KNOW You Want One. 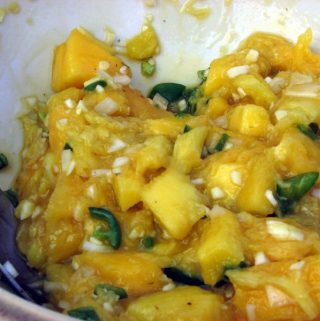 Mango Recipe: Curried Mango Quinoa Salad – YES. YES. YES!! 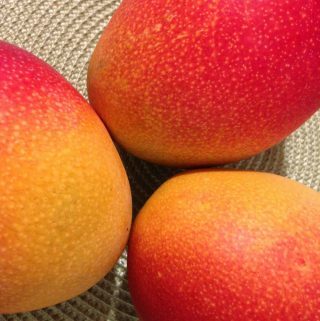 Ataulfo Mangoes Arrive at Harry & David in June! Get ’em While You Can.